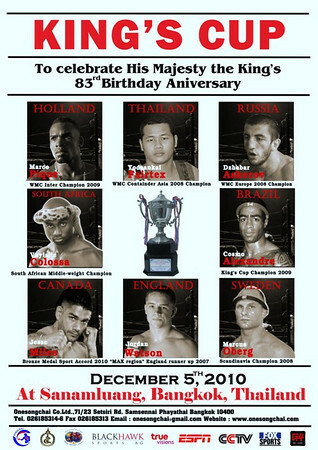 It looks like Songchai’s going to be putting together another internationally flavored 8-man tournament to commerate the King of Thailand’s 83rd birthday. Just looking at the line up and some of the expected matchups it looks at least on paper very promising. 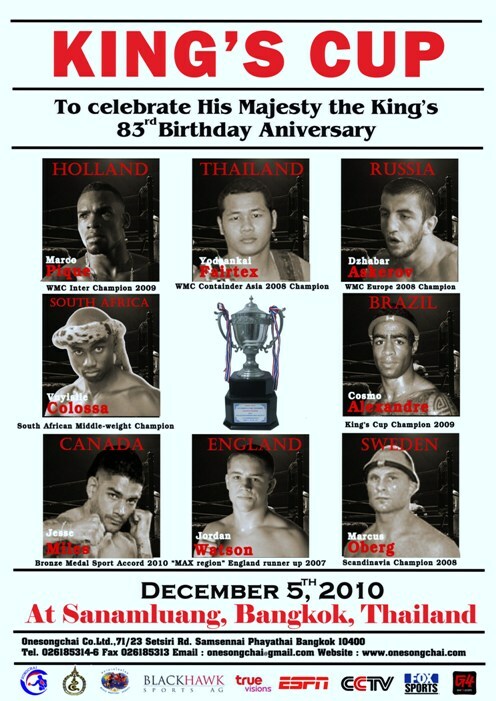 It almost appears to be a rogue’s gallery of past opponents of Yodsaenklai with Holland’s Marco Pique, Brazil’s Cosmo Alexander , Vuylise Colossa and Contender Asia’s Dhzabar Askerov in the line up. One very obvious and out of place competitor is Jesse Miles of Calgary’s Mike Miles gym. Jesse Miles is actually the fighter incorrectly named as Sweden’s Marcus Oberg of Sweden. Jesse Miles recently won a WKL ‘world title’. Notably most titles are vacant from the WKL and apparently a WMC title of any stripe could not be brokered by Canadian WMC arm Mike Miles’. Coinciding with this new 8 man tournament the Final round of Thai Fight will also be highlighted with the 1st half of the final tournament being set earlier in the day and the 2nd half concluding at night. ~ by fatsoking on October 27, 2010. So, according to the poster; who’s really in the tournament? Oberg or Miles? Miles is a prestigious world title holder with the highly esteemed WKL. He could win this tournament in his sleep. I’ve followed this sport since 1987 and made it my living for almost seven years (journalist, TV-commentary incl. PPVs etc. etc.) and I’ve NEVER heard of the WKL – I have heard about the guy who wins whilst being unconscious on the canvas though! And to even mention him in the same sentence says a lot about you: Oberg is a WORLD CLASS Muaythai fighter who would KILL Miles under any format! Hmmm, must be from Calgary… First off: the WKL has numerous vacancies in their world championship holdings(could probably count on one hand as to how many titles are actually held). Second, his former stablemate Trevor Smandych is a more accomplished fighter and was put away in “The Contender Asia” (where Yod and Dzhabar appeared as well). Third – even though Miles won his last tournament in his sleep at the Contender Asia qualifier (Canadian contigent) doesn’t mean that he can win this tournament ‘in his sleep’. Amusing post! Membership has its privileges. Smandych got his chance to be publicly humiliated in a public format by being put in way over his depth along with Martinez, Zidov and many others. Miles’ vanity project is spun way out of control and Jesse’s inclusion in a King’s Cup exemplifies it further. Why isn’t Artem Levin in this one? Not sure. But I would love to see it too. What weight is set for the tournament? If it’s less then 75kg then Artem is not in under any circumstances. But he’d like to face in the ring his fellow contenders. woooaaaah what a bummer for liam. thats such a shame. A+ for Jordan Watson fighting at the King’s Cup – awesome!